Bernard Faurie, or should I say the family of Bernard Faurie has owned vines in Hermitage since 1935. Bernard Faurie is the fourth generation of his family to work in Hermitage. Bernard Faurie learned the wine trade from his father. In those days, their vineyard was divided between three relatives, each owning .56 hectares on the Hill of Hermitage. Bernard Faurie owns 1.7 hectares of vines in Hermitage. They have holdings in the Les Bessards, Greffieux and Le Meal lieux-dits. They have a steep hillside terroir of granite, rocks, quartz, clay, limestone and stone based soils. Their oldest vines are on Greffieux, which are more than 100 years of age. On Le Meal, the vines are close to 60 years of age. In Hermitage, Bernard Faurie produces red Hermitage wines and 1 white Hermitage wine. To produce the red Hermitage wines of Bernard Faurie, the grapes are whole cluster fermented in large, old, oak vats. the wines are aged in old, used demi-muids for between 18 to 24 months before bottling. Previously, the wines were aged in old, oak barrels for up to 36 months, but that has since changed. The aging term is determined by the character and quality of the vintage. 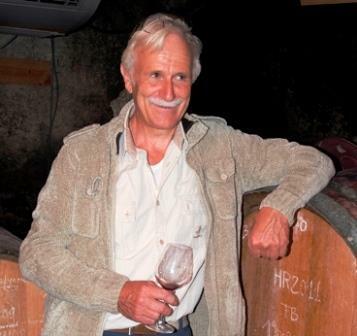 Since 1994, Bernard Faurie has produced 3 red Hermitage wines and one white Hermitage wine. The specific vineyards where the vines are planted are not listed on the labels. Instead, each of the 3 red wines from Bernard Faurie features different colored capsules to help you tell them apart. Bernard Faurie with the cream colored capsule is a blend of Syrah planted in Les Bessards and Le Meal. Bernard Faurie with the plain gold capsule is produced from Syrah planted in the Greffieux and Les Bessards vineyards. Bernard Faurie with the gold capsule featuring the letter M is made from 100% Syrah planted in the Le Meal lieu-dit. Bernard Faurie Hermitage Blanc is produced from 100% old vine Marsanne. The white wine is vinified in demi-muids, of which only 10% are new barrels. The wine is aged for between 9 to 12 months before bottling. Domaine Belle, when young, should be decanted at least 2-3 hours, give or take, allowing the wines to soften and open their perfume. Older vintages might need very little decanting, just enough to remove the sediment. Domaine Belle is usually better with 8-10 years of cellaring and should be at its best between 10-25 years of age. Bernard Faurie is best served at 15.5 degrees Celsius, 60 degrees Fahrenheit. The cool, almost cellar temperature gives the wine more freshness and lift. Bernard Faurie is best served with all types of classic meat dishes, veal, pork, beef, lamb, duck, game, roast chicken, roasted, braised and grilled dishes. Bernard Faurie is also good with Asian dishes, hearty fish courses like tuna, mushrooms and pasta. Bernard Faurie, the white wine of Bernard Faurie is best served with a myriad of different seafood dishes, shellfish, crab, lobster, sushi, sashimi, chicken, pork and veal, as well as Asian cuisine. In the Northern Rhone Valley, Bernard Faurie also produces wine from 2 hectares of vines they own in the St. Joseph appellation. In St. Joseph, they produce a standard wine and a Vieilles Vignes. Young, as you would expect. There are still tannins needing to be resolved. But the firm, crisp red and black fruits, earth, pepper and mineral driven, crushed stone nose is right there. Full bodied and concentrated, with crisp freshness to the fruits, this classic Hermitage will be even better with another 3-5 years in the bottle. Full bodied, young, fresh, bright, vibrant, tannic and needing time before it really offers up all its stony, dark red fruits, pepper, earth and floral personality. Fully mature, the last bottle from the cellar was as you might have guessed, the best. Meaty, stony, crisp, sweet and tart red berries, wet earth, leaf, pepper, herbs and tobacco notes were all in plain view. The wine was focused more on the aromatic complexity than weight or length.